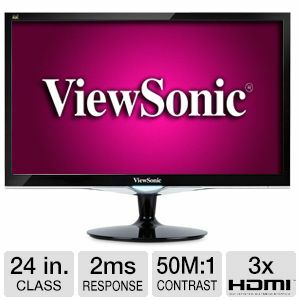 The�Viewsonic 24 in. Class LED Monitor offers flexible mounting options for any of your gaming and video entertainment needs. It features ClearMotivII technology that delivers 2 ms ultra-fast response time for blur-free images during extreme gaming, and an ultra-high 50M:1 MEGA dynamic contrast ratio for sharp, crisp color performance for enjoying movies. As it has best pixel performance policy, it makes the Viewsonic monitor a great long-term investment. 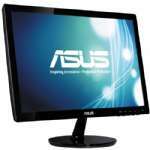 Its�24 in. (23.6 in. 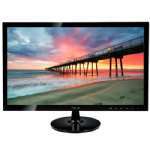 viewable) Full HD screen ensures ultimate visual experience for gaming and multimedia entertainment at home.��With the�D-sub, DVI, and HDMI inputs, it provides flexible connectivity for HD multimedia devices.�Order the Viewsonic 24 in. Class LED Monitor now! 22.0" x 14.0" x 2.1"
22.0" x 17.0" x 8.8"